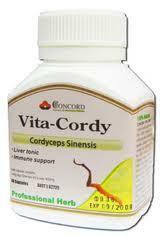 Concord Vita-Cordy is an all natural product made from 100% Cordyceps Sinensis. For five thousand years of Chinese history, Cordyceps Sinensis has been renowned for its premier abilities in enhancing energy and maintaining health. Its recent popularity soared when a number of world-class athletes ascribed part of their record-breaking achievement to daily supplementation with natural Cordyceps Sinensis. Despite its popularity, its background remains mysterious. In the grassy plateau of Northern China at an altitude over 6000 metres, there is a type of caterpillar larva—Hepialus armoricanus Oberthuer. While it hibernates in winter, a long and thin fungus finds its way into the larvae. ADULTS: 1-2 capsules daily for maintaining health. For therapeutical purposes, 3 capsules twice a day. If symptoms persist, consult you health doctor. May be taken in conjunction with Western medicine. Adult only. All products are NOT to be used in children under two years of age without medical advice. Always read the label and use only as directed.